Following the success of the recent H.P. 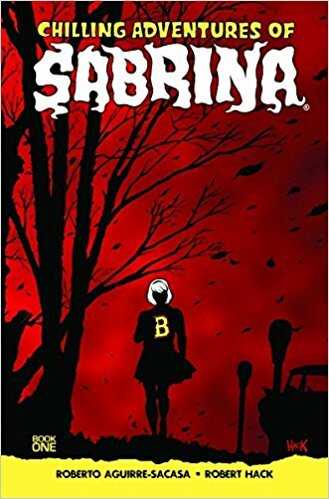 Lovecraft-inspired Afterlife with Archie series, Archie Comics decided to follow it up with a Sabrina the Teenage Witch-inspired title, Chilling Adventures of Sabrina. The two series don't seem to exist in the same world, but they have one major thing in common: both are remarkably effective horror stories. Sabrina is an excellent pastiche of vintage horror comics. The artwork is straight out of a Gothic title from 1973. The story thus far is intriguing, although the writer seems more interested in the trappings of his world than his storytelling. Maybe these characters are so well-known to longtime Archie/Sabrina readers that this version's slapdash development doesn't matter, but for someone like me, the few details Aguirre-Sacasa includes about Sabrina and her friends just makes them seem extremely unpleasant. I'm totally in favor of faux-vintage horror, but I wish this series had included at least one character I could root for.